At 84, Steinem was as charming, modest and well-spoken as ever. She reiterated a phrase that Lahti had spoken in the play’s opening scene, that she is a “hope-aholic.” Her optimism was comforting to hear at the beginning and the end. The play starts with projections on screens that can be seen from anywhere in the theater. They include short clips of the 1970 March down Fifth Avenue, Steinem announcing “This is a revolution, not just a reform,” and the 2017 women’s march on Washington. Very little of this comes across as didactic, though there is a certain pep rally vibe (and, alas, a preaching to the choir element that probably no amount of marketing to anti-feminists could overcome). Playwright Emily Mann and director Diane Paulus have crafted a warm, seamless, fast-paced and entertaining show. They are part of a nearly all-female behind-the-scenes ensemble, including the owner of the namesake Daryl Roth Theater, the lead producer. She turns to the audience: “But it’s too late—I am one of these crazy women.” Painfully, she realizes that she has been complicit “in all the humiliations. It’s not just that we live in a patriarchy. It’s that the patriarchy lives in us, right?” Many audience members nodded. That’s still going on. The play explores the complicated relationship that Steinem had with her mother, Ruth, who was smart and loving but also a prescription drug-addicted invalid whom Steinem had to care for starting when she was 11, after her feckless father left and her sister went to college. Steinem has been criticized in some quarters as the ultimate mainstream white feminist. 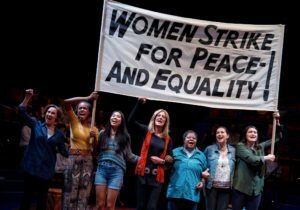 Yet the play showcases the many women of color who, as Steinem has often acknowleged, helped found the feminist movement along with her without getting the same media attention. They include Dorothy Pitman Hughes, another co-founder of the highly successful and influential Ms. magazine, and Florynce (Flo) Kennedy, an attorney and an activist who had a outsized personality and is revered by feminists who know about her. Bella Abzug, the Jewish Congresswoman, lawyer and feminist leader, is another vividly-portrayed character, as is Wilma Mankiller, Chief of the Cherokee Nation. One of the unexpected impacts of the play is that it makes audience members (which included some men) feel better about the state of the world today by focusing on the strides that have been made in the last few decades. Reacting to women who expressed frustration and fatigue, Steinem said that the Golden Rule, fashioned by men, needs to be turned inside-out for women–that we need to learn to “treat ourselves as well as we treat other people.” Good advice.